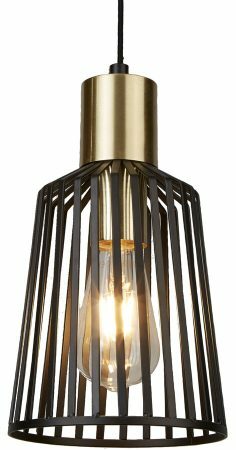 This Bird Cage 1 light small pendant ceiling light in black and gold finish is stylish and boasts an industrial style look. A simple design featuring a circular ceiling cup, flex suspension and large satin gold finish fitter and lamp holder, with small 16cm black tapered cage shade. The light from the central bulb spills through the gaps in the frame creating patterns throughout the whole room. This small adjustable height pendant is sophisticated and stylish with a minimal black and satin gold design. The design features an on trend industrial inspired black bird cage frame and is complemented by the contrasting gold. Perfect for any breakfast room, hallway, bedroom, home office or kitchen installed singly or in clusters. Height adjustable at the time of fitting by shortening the flex to achieve the perfect drop, please see the technical information below for dimensions. There are matching fittings available in the Bird Cage pendant range that includes medium and large versions; please see below. This industrial light is supplied by Searchlight who manufacture some of the best traditional and modern classic designs such as the Bird Cage 1 light small pendant ceiling light in black and gold finish you see here.